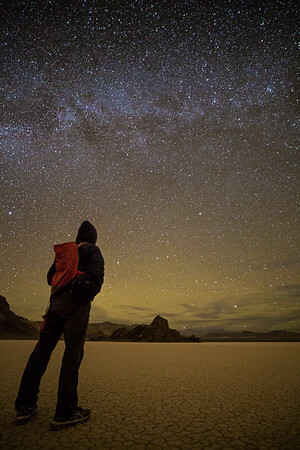 Back in November, I made a short trip to Death Valley National Park. Primarily I wanted to visit Racetrack, past Ubehebe Crater, which I couldn't make it last time, due to the fact that I didn't have a high clearance vehicle. Based on my experience, it would've been okay, but I am glad that I made the trip this time, because I also included a camping night at Mahogany Flat Campground, which definitely needed just that. And along the way, I took some photos at Wildrose Charcoal Kilns as well. 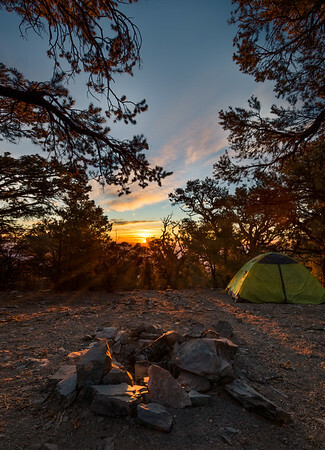 The sun was setting fast when I was still a few miles away from Mahogany Flat Campground. Night would fall soon. The sunset glow cast on the ridgeline caught my eye. I pulled over and got out of the car. No one was around. Completely deserted. No cars coming in either direction. Temperature was dropping fast as the light was fleeting. It was going to be chilly at the campground. Once the glow was completely faded, I got back in the car and left. With my camera and tripod in hands, I sauntered off Mahogany Flat Campground, where I was camping. Found a clearing on the slope, but it was extremely windy. It would have made my stay unbearable without bundling myself up in my 15-degree sleeping bag. I held it tight while wondering how cold it would have been at the top of Telescope Peak, which was 3,000 feet higher. 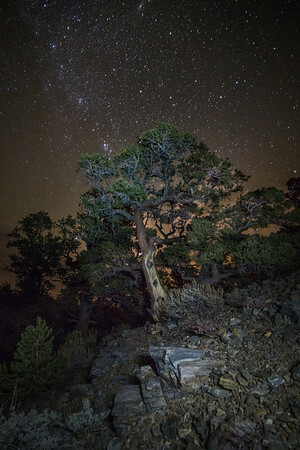 In the company of gorgeous Junipers, I sat down, pointed the camera at the Milky Way, risen over the mountain ridgeline, and pressed the remote shutter. This particular Juniper, standing upright in the slanted slope, caught my eye. 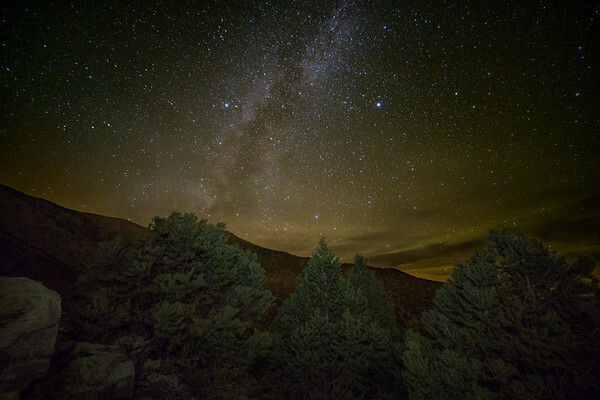 While composing a shot, I realized that the Andromeda Galaxy, aka M31, was shining above this handsome evergreen. Of course, it was! It was November! Super excited, once framing the conifer in the center with the painted rocks strewn all around it at the bottom and our neighboring galaxy at the top, I was more than ready to take the shot. Then, I gently pressed the remote shutter. Morning arrived. I felt the crisp air filling my lungs at every breath. If the frost on the windshield was a clear indication, it was definitely a chilly night at 8000 feet in elevation. I got my camera ready before the fire pit and waited for the sun to rise above the ridge line. Probably around Dante’s View, I thought to myself. Soon it did and started casting gorgeous orange glow on the Junipers around me. I felt the warmth. Time to get moving. 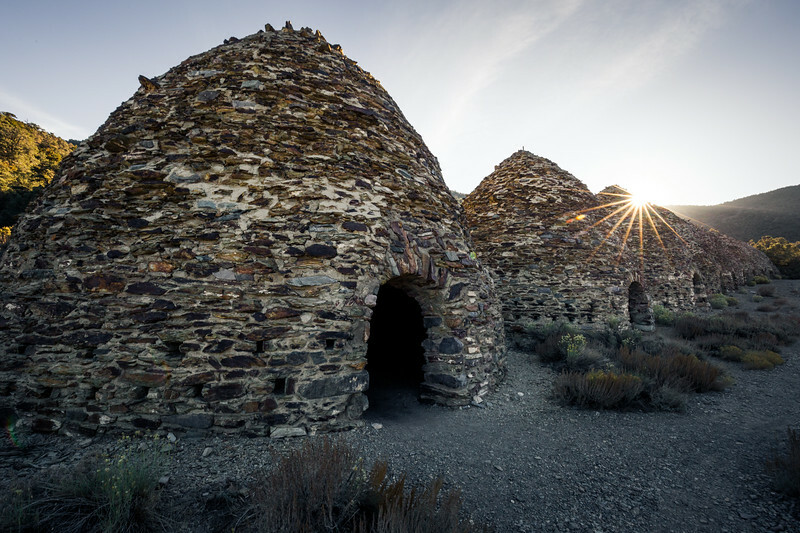 The sun was still low enough when I pulled over at the iconic Wildrose Charcoal Kilns, which was on the way back from Mahogany Flat Campground. Considering its interesting historical background, it was relatively deserted. While recalling some cool shots of stars trailing above these kilns, I waited for the sun to rise over the ridge line. 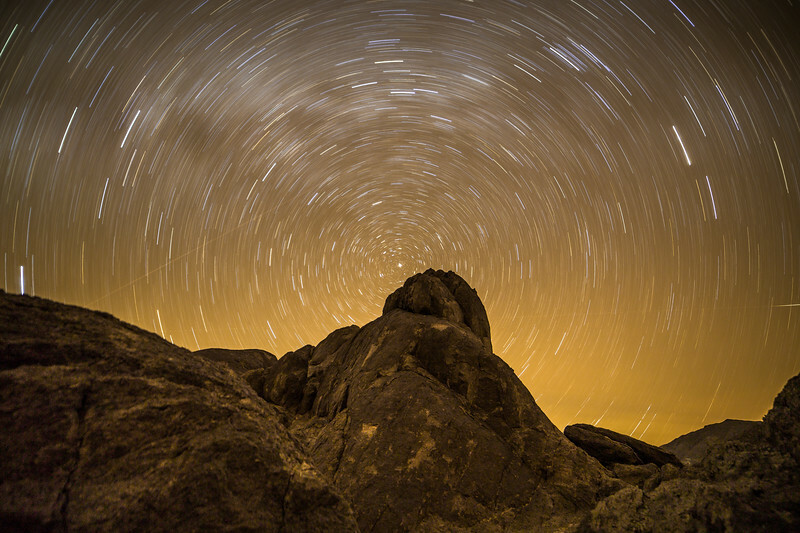 Definitely one more reason to return to capture my own star trails. 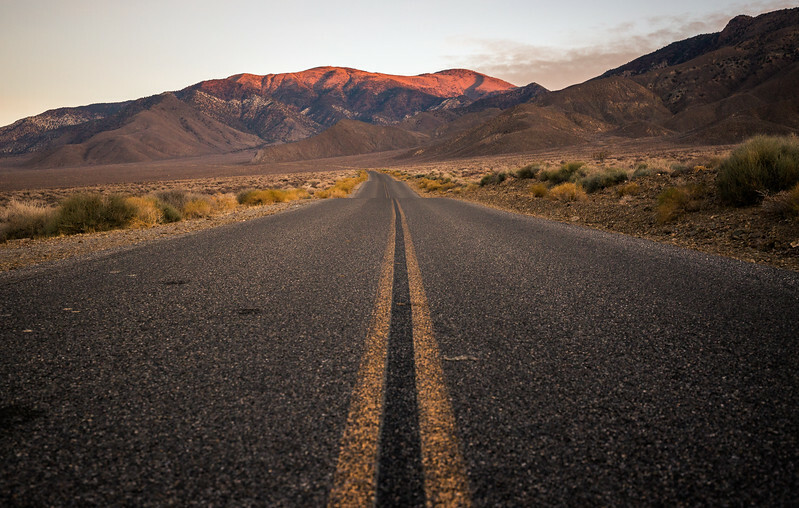 Once I left Mahogany Flat, I drove straight to the Racetrack, one of the most iconic landmarks in Death Valley, which I’d been wanting to visit for quite some time. My last attempt was over a year ago. Particularly known for its 1.5-inch-a-year sailing stones, this racetrack-shaped dry lakebed lay about 25 miles beyond Ubehebe Crater. Once night fell, thanks to, probably, the almost freezing temperature, no one was around. 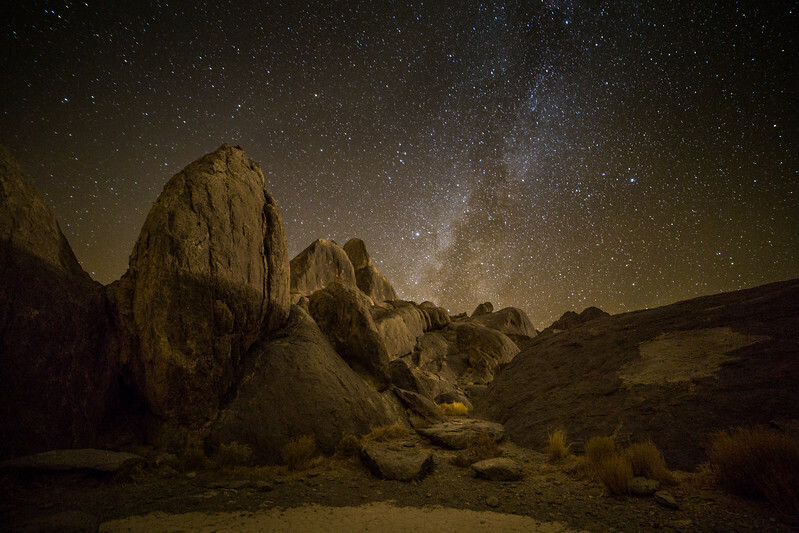 Literally, I had this enormous floor filled with mud cracks all to myself while the Milky Way was slowly moving across the heavenly body. I was a happy camper. With the entire lake all to myself, I literally walked to every corner of this mud crack filled lake floor, as long as the Grandstand was in the frame. 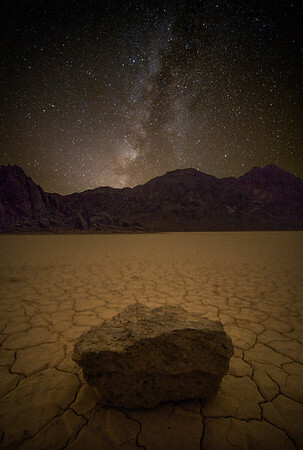 While composing a shot of the mound of this monolith with the Milky Way slowly traversing the stars-strewn sky, a vehicle with headlights on zoomed by the lake. Contrary to my initial thought about this unintended light painting work, I decided to stack it with other exposures. And the result was satisfactory. After spending a good couple of hours in this lake floor with not a single soul around, I decided to try a selfie. If you have done this before, you know holding still for longer than 2 minutes, let alone 30 seconds, isn’t an easy thing to do, especially when it is quite cold. Once I framed the shot with myself clear of the Grandstand and the Milky Way over my head, I stepped onto my mark and pressed the remote shutter. It was one of the longest 146 seconds I could remember. Throughout the night, I had been looking at Polaris to do star trails. While strolling around at the foot of the Grandstand, one of the mounds with a dome shape stood out for me. While trying to keep myself warm, I wondered about the star trails seen from Mars. The temperature at the Racetrack was about the average high temperature high (36F) in July in Gale Crater on Mars, where Curiosity, NASA’s Mar rover, roamed around. It was time to pack up my gear and say good night to the monolith.